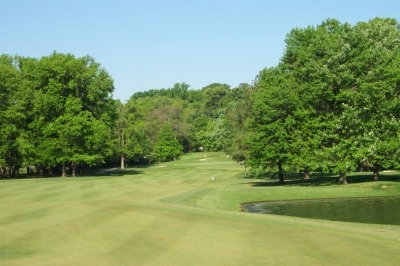 ALEXANDRIA, VA � What recently occurred with the golf course renovation at Belle Haven Country Club was more than just a case of out with the old, in with the new. Appropriately put, it was palimpsest at its finest. Belle Haven's 12th green, complete with a brand new pond on the right, and bunkers to the left. If you�d merely substitute the words �golf course� for the terms �manuscript� and �words� in the above definition, you�ll get the point of what happened at Belle Haven. The highly regarded club was founded in 1924 and has an illustrious, rich history. 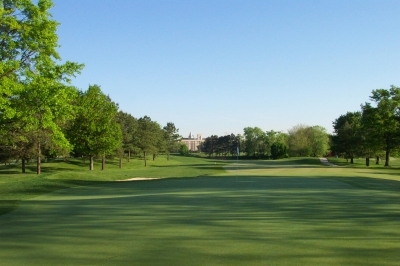 Yet a few years back, like many of the older golf clubs in the area, it needed some improvements to bring it up to the playability and interest standards of modern golf course designs. Arthur Hills thinks every course should have at least one long par four, and the 8th hole fulfills that belief nicely. The wish list didn�t conclude with getting rid of the water, either. �Then �we�ve got to fix the drainage,� turned into �you know what, we might as well fix the greens, too.� Then it became �we might as well do the bunkers while we�re at it,� and before long, �let�s just do the whole thing.� The complete remake idea was put before the membership, and was received enthusiastically,� Danielson added. 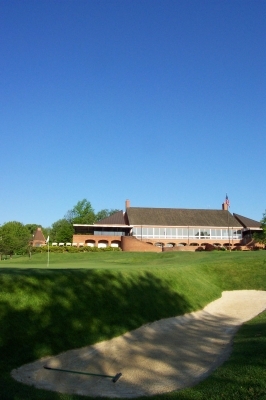 Arthur Hills seemed to be the right man for the job, having already renovated several of the DC area�s distinguished private clubs, Congressional Country Club�s Gold Course, Chevy Chase, Bethesda and Burning Tree Country Club to name a few. As soon as Hills came in, the work began, and play stopped. Renovating a resort course is certainly a financial strain on its owners, subtracting revenue from the golf course as well as losing a draw for potential visitors and hotel guests. But losing your country club�s golf course for a period of time is arguably worse, since you�ve already paid your initiation fee, and the dues don�t end just because you don�t have a golf course. Belle Haven's 17th hole changed perhaps the least of any after the renovation. With such natural beauty, you can appreciate why. Meanwhile, back at Belle Haven, palimpsest was in full swing. Hills said the first order of business was installing a new pump system on the course to alleviate the flooding problem. 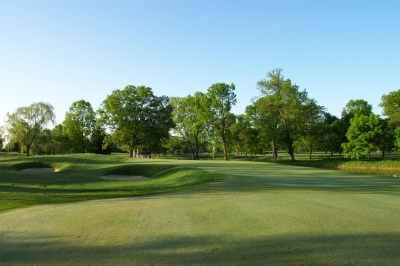 The next was to redesign the golf course to bring it up to contemporary standards, while also preserving the traditional, old-style feel of a country club golf course built in the 1920�s. Looking back from the 14th green, you can see Alexandria in the background. That's really the only way you'll know that you're close to the city. The golf course suffered from more than just civil engineering concerns. It was largely flat and lacked a good many of the strategic qualities that lend themselves towards playing golf of continuing interest. Members wanted more challenge in the new design, and they also wanted some of the unfair aspects of a golf course that�d evolved over time taken out. 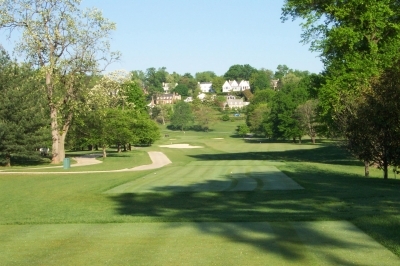 With that in mind, Hills re-graded some of the fairways, raised the greens, installed mounding to give the course some contour, added pot bunkers in places to provide definition, and even put in a British style narrow bunker with a steep slope next to the 18th hole�s green to include an extra bit of character. 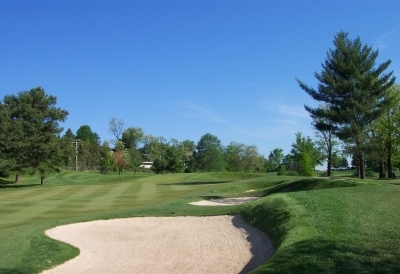 To put it mildly, the Hills group did what they had to make the course look new, but also designed a layout that fits well with the club�s history and surrounding neighborhoods. Palimpsest � building something new over the old, where you�ll understand the changes but still be able to appreciate what was there before. Perhaps a stretched analogy, but it works at Belle Haven. Hills said the par four 3rd hole was weak prior to renovation -- he strengthened it by adding trees to the dogleg and raising the green. In Belle Haven�s first full season after re-opening, the conditions are some of the best we�ve seen � the greens were a bit slower than we expected after noting the pristine putting surfaces, but Augustine said he wants to make sure the roots are healthy and stable before cutting the grass down even lower. They�ll get there. Superintendent Mike Augustine said the 15th hole used to be completely flat. If you'll look at it now, that's hard to believe. 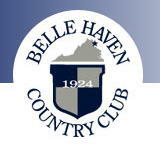 The �new� golf course only adds to Belle Haven�s overall appeal. Danielson said being so close to the Capital, as well as Old Town Alexandria has made the club a popular place for lobbyists and Congressmen � because they can get there in fifteen minutes. He said there was a case a couple weeks back where a gentleman called from the Oval Office to let his group on the first tee know that he was on his way � then was able to join them on the second green. And he didn�t even use a helicopter. And despite being attractive to politicos and businessmen, Belle Haven hasn�t lost its family oriented reputation. �I�ve been here thirteen years now, and our club�s changed a lot in those years � but it�s still a very traditional club. One thing that hasn�t changed is that we�re very family oriented. I think we really go out of our way to show that young people are welcome here, and the families who�ve joined really appreciate that,� Danielson said. 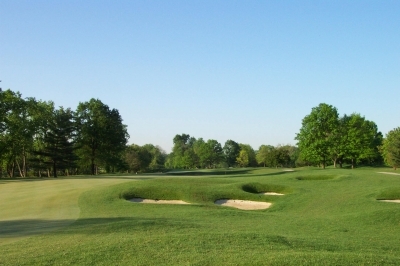 Those members certainly enjoy the challenging aspects of the �new� golf course. Because Hills� creation rests on top of an �ancient� (by modern standards) golf course, there are mature trees throughout the layout. Probably the most difficult aspect of playing it is staying out of the trees and positioning tee shots for the best approach to the always challenging Arthur Hills greens. The par five 4th hole was one of our favorites, because you've got a dogleg option on where to aim your tee shot. If you're here in this view, go for the green! Good thinking by a Head Golf Professional � and a clever way to increase your short-game lessons sales at the same time. But hitting greens shouldn�t be as big of a problem if you play the correct set of tees. Danielson says it�s a nightmare if you�re playing a bit farther back than from where you should be. Most holes provide a very generous area to land the ball � which was also part of Hills� strategic thinking. Just don�t miss too much. You'll see pot bunkers on the par five 16th hole -- a nice touch to provide some definition to the hole. At a little over 6900 yards from the back tees, accuracy�s the name over distance. As mentioned above, it�s an old-style placement golf course. One highly recommended piece of hardware to help in placing the ball is the club�s yardage book � one of the better ones we�ve seen, and a bargain at $5. To mention just a couple highlight holes, we particularly enjoyed the par five fourth and twelfth holes. 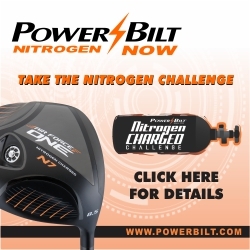 Four plays �only� 530 yards from the back tee, but its challenge comes from a choice you�ll make on the tee. 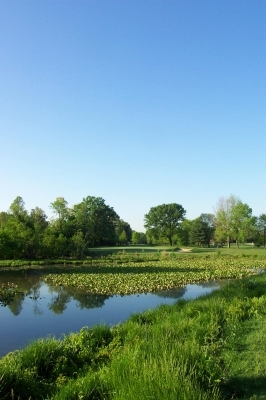 The dogleg right hugs a lake -- if you can hit a high fade, you�ll be in good shape to go at the green in two. But if you pick the wrong spot to aim at, you�re reaching for another ball. Good risk-reward hole. Twelve is one of the most picturesque holes on the course due to Hills� mounding and a pond placed on the right side of the green and bunkers on the left (the putting surface slopes towards the water). At 555 yards and straight-on, long hitters might be able to get there in two, but as Augustine told us during a tour, you don�t want to miss left, right or long. Not a good miss selection there. The short par four 5th hole, like all of Hills' short holes, hardly lacks in strategic qualities. The Belle Haven clubhouse is currently undergoing renovation (golf course done, now it�s the clubhouse�s turn), and when finished will be on par with the best in the area. �Our tennis facilities have always been great, but now they�ll be outstanding � we�ll have something like thirteen tennis courts of different types. And our pool is a really big pool and very kid friendly,� Danielson said. Belle Haven's 18th green definitely has an old-style feel. 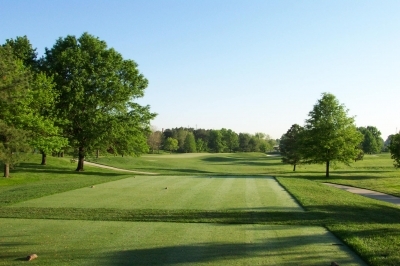 That about sums it up for Belle Haven Country Club � it�s big (as in quality) and friendly. It�s a case where the old was pretty good, but the new is that much better. You can see the difference, and you�ve learned a new word in the process. Now you�ll probably want to have palimpsest at your own club. Consult the club�s website for membership contacts. 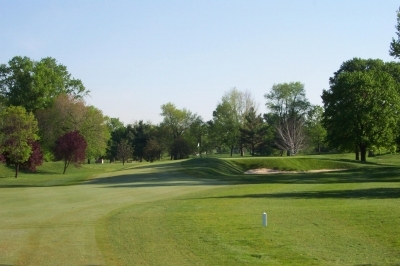 Unrestricted walking available at all times on this very walker-friendly golf course.